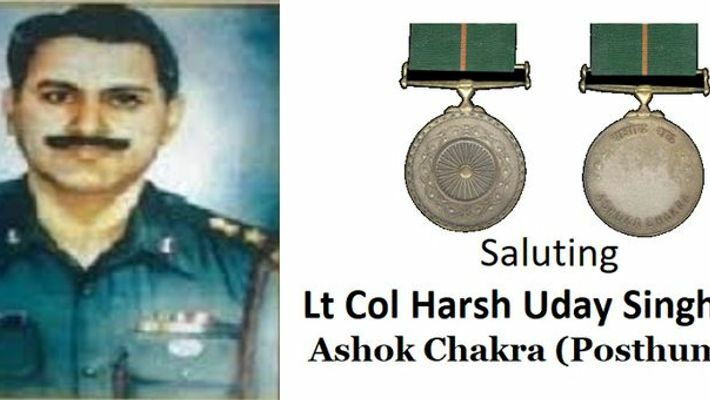 Born in a military family hailing from the Hardoi town of Uttar Pradesh in 1953, Lieutenant Colonel Harsh Uday Singh Gaur completed his graduation before joining the Officers Training Academy in Chennai, Tamil Nadu, in 1973. After completing his training, the officer was commissioned into the Bihar regiment and was commanding his unit in Baramula in Kashmir at the peak of terrorism in the state. On November 29, 1994, Gaur was informed about a gathering of 10-12 terrorists in a village nearby his unit location. The officer immediately launched a cordon and search operation, which he led himself. During the search operation, a gun battle was triggered after the terrorists fired at the troops. Gaur quickly redeployed his troops and blocked all the possible escape routes of the terrorists. The officer then launched a surprise attack on the terrorists, who were believed to be Afghan mercenaries. Gaur eliminated three terrorists in the gun battle and also neutralised their universal machine gun. While neutralising the universal machine gun hidden behind a rock, the officer lobbed a grenade at the enemies’ position. However, Gaur later succumbed to the injuries he received in the battle. For his bravery, Gaur was given the nation’s highest peacetime gallantry award, the Ashok Chakra (posthumous).